Like many of his contemporaries, Marin Marais has paid the price of his proximity to some outstandingly brilliant musicians. Between Lully and Rameau we can still cite Charpentier, Delalande, Campra and François Couperin. But what about the others? The Destouches, Mouret and Marais pale beside the stars of a fertile era which was rocked by controversy. The school of harpsichordists and organists, who were no match for Lully’s vocal art, are still represented in the repertoire of present-day performers: D’Anglebert, Lebègue, Dandrieu, Grigny and Clérambault are still played on our instruments. 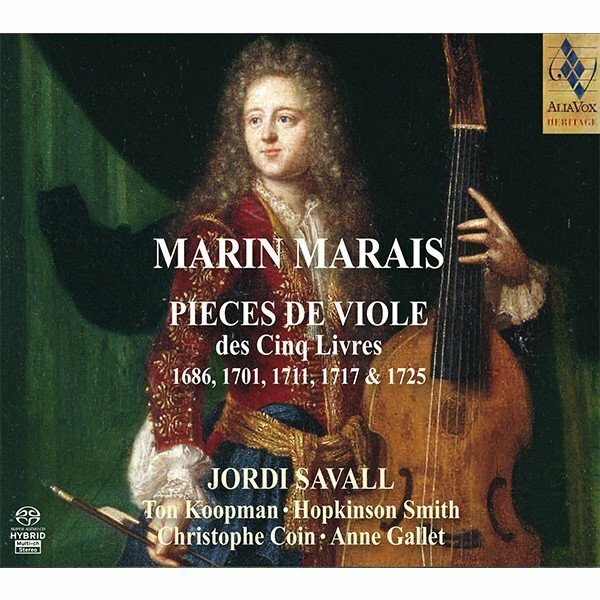 But Marin Marais had the misfortune not only to compose operas in Lully’s domain, but also to devote the bulk of his art to an instrument which was being eclipsed by the advance of the violin family… namely, the VIOLA DA GAMBA or the BASS VIOL. And it is only recently that we have rediscovered the specific manner of playing this instrument as well as the composers who wrote for it. Juillet 1975, janvier 1977, mars 1983, janvier 1992 en l’église romane de Saint-Lambert-des-Bois, Yv et l’église d’Habloville, Orne (France). Born on 31 May 1656, the son of a shoemaker, Marin Marais became a chorister at Saint-Germain-l’Auxerrois in Paris, around the same time as another boy with a promising future, M.R. Delalande (1656-1726), who was to make his name as a composer of sacred music. At sixteen Marais left the choir school to become a pupil of Sainte-Colombe, a virtuoso on the viola da gamba, who had brought the instrument’s technique to such perfection that he could, in the words of H. Le Blanc, “imitate the most beautiful ornaments of the voice” (Défense de la Basse de Viole, 1740). The viola da gamba was, in fact, just beginning to enjoy popularity in France. In 1636, Marin Mersenne wrote in his Harmonie Universelle: “Those who have heard excellent performers and good ensembles of Viols, know that, except for good voices, there is nothing as ravishing as the languishing bow strokes which accompany the trills which are done on the fingerboard, but since it is no less difficult to describe their grace as that of a perfect Orator, they have to be heard to be understood.” The English school, introduced into France by Richelieu’s viol player, André Maugars, later helped to give the French viol its own technique and style, which masters like Sainte-Colombe brought to even greater perfection. Marin Marais took advantage of this teaching and soon surpassed his master. At the age of twenty he was engaged as Court Composer and in 1679 was appointed Musician in Ordinary to the King’s Chamber for the viol, a post that he continued to occupy until 1725, shortly before his death. His rise to fame was a rapid one: in 1680 he was cited, alongside his teacher, among the great virtuosi of the day. He divided his time between his duties at court, composition and teaching the viol. Marin Marais thus found himself at the heart of French musical life – the Royal Court. In fact, since the time of Louis XIII, instrumental music had not been nourished, as in the sixteenth century, by popular festivities in which all the social classes combined to celebrate the solemn Progress of the King, the head of a guild or the advent of Spring, for which performers from the populace formed associations and exercised their talents. After 1620, the king gathered to his court the best musicians, especially since it was necessary to replace the Italians who had left, upset by the troubles of civil wars and by their poor appointments. 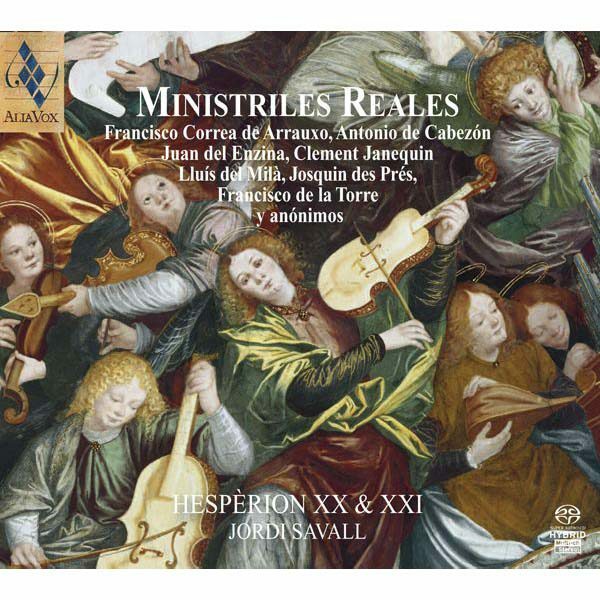 Deprived of their best musicians, the confraternity of popular “instrumentalists” underwent a slow decline which Couperin was to depict with great humour in his harpsichord piece entitled Les Fastes de La Grande et Ancienne Ménestrandise. Listening to good music became the preserve of the privileged few, who assembled for the purpose at court, in special rooms and at fixed times. Music catered for the entertainment, as well as the pomp and ceremony of fine society, and to this end the “Vingt-quatre Violons du Roy” (The King’s 24 Strings) and the “12 hautbois” (The Twelve Oboes) were formed. It was in the new “concert” setting that Marais exercised his virtuoso talent. But the instrumentalists of the period were also at the same time composers. In this regard Marais was the disciple of Lully. He certainly expressed great admiration for the master, dedicating to him in 1686 his first book of music for the viol, describing him as his “benefactor” and “protector”. This high regard was mutual for, according to Titon du Tillet, a historian of the period, Lully often engaged Marais to beat time in the performance of his operas. In the same year that this first book was published, Marais enjoyed great success with his debut as a court composer: an Idylle dramatique celebrating Peace was staged at Versailles, and the Dauphine enjoyed it so much that she immediately demanded a repeat performance. The composer’s prestige was still acknowledged in 1701 when, for the Dauphin’s convalescence, it was Marais rather than Delalande, the official court composer, who was commissioned to write a Te Deum Mass. The career of Marin Marais unfolded at the height of the “musical war” between the goût italien and the goût français. 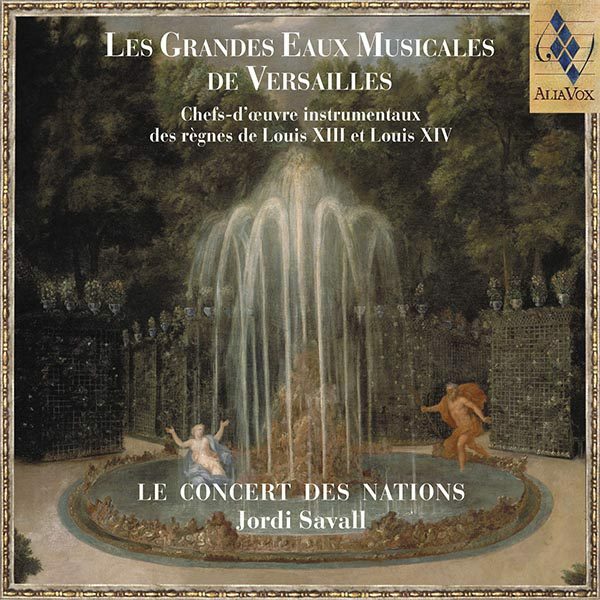 For a long time the establishment of Italian music in France had been opposed by Lully. After his death, in 1687, the Italian lobby grew stronger and stronger, the more so since it already had its French partisans. These partisans had hitherto met secretly to play music by Bononcini, A. Scarlatti and Stradella. In the operatic field, these Italians ensured the triumph of melodic ornamentation, vocal acrobatics, a subtle harmony full of chromatism, dissonances and modulations. Marais did not risk any of these innovations. Wildly anti-Italian, his four surviving operas composed between 1693 and 1709 follow all the principles of Lullian opera: clarity of textual declamation, recitatives with a slightly melodic tendency and daring intervals used solely for expressive ends, and a simple, clear harmony favouring the comprehension of the text. Innovation in this area would have led to certain failure, for he would have been up against the defenders of Lully and French music who were the opera-going public. in all, about seven hundred pieces “suitable for playing on all sorts of instruments.” A firm believer in the value of his country’s national tradition, Marais condemned Italian sonatas to the extent of forbidding his pupils to play them! He concentrated solely on the Suite, which at first was simply a juxtaposition of dances written in the same key and assembled for the convenience of the performer; the latter would choose a few pieces to make a group “of just proportions” without necessarily having to play the whole Suite. The present recording offers a Suite, a series of variations and a character piece, all taken from the Second Livre, which appeared in 1701. Marin Marais perfectly illustrates that fondness for contrast that characterises the music of the Baroque era. We find it in the variations in dynamics, between the forte and piano and in tempi, where slow passages are linked to quick ones without transition. Variety of colour is provided by the multiple possibilities afforded by the full gamut of the instrument’s registers and the ways in which it can be played; at the same time, its polyphonic “voices” allow us to hear a voluble upper part with a quiet lower one, or vice versa. The “jeu de mélodie” and the “jeu d’harmonie” compete and alternate in the pieces in the Suite: according to the theorist Jean Rousseau, the player should sometimes “imitate everything charming and agreeable that the voice can do”, with “tenderness” and “delicacy”, and sometimes sustain several independent voices at once, which requires “great aptitude” and “plenty of practice”. He may also combine melody and harmony in a finished style in which the chords, far from inhibiting the movement of the top line, give it foundation and richness. 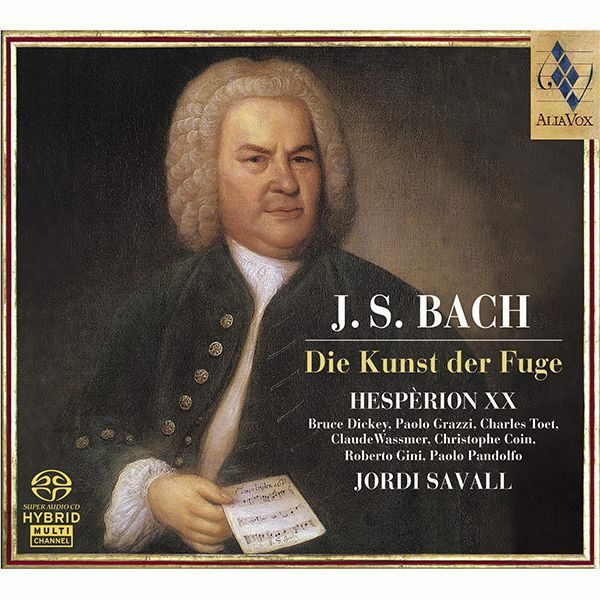 In the thirty-two couplets of the Folies d’Espagne (an old Iberian dance), Marais especially exploits writing in “broken chords”: over a slow-moving bass line, he superimposes a mosaic of quick notes in scales or arpeggios. At times the music seems to flow of its own accord, in keeping with the traditional dances of the period, while at others its unexpected modulations and suspensions go so far as to suggest that the performer is improvising. The Tombeau pour Monsieur de Lully in particular strikes us as surprisingly modern. 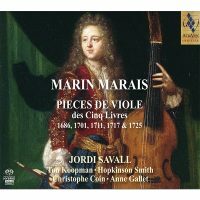 Unfortunately, Marais’ pieces for viol came at the end of an era: in the last years of the seventeenth century, the indispensable viols, without which no music for church or chamber would have been possible, and which were considered as the aristocrats of string instruments, were replaced in Italy by the violin family. Corelli brought this instrument’s technique to a peak of perfection. In 1700, one year before the publication of Marin Marais’ Second Livre de Piéces de Viole, he published his famous opus 5 which was to go through thirty editions and inspire two generations of composers. As if by chance, it contains a series of variations on the Follia theme, in which Corelli sums up the technique of the violin as he conceived it. More brilliant than the viol, the violin usurped the latter’s place in the “jeu de melodie”. The keyboard instruments – harpsichords and organs – proved much more suitable for the “jeu d’harmonie.” Ultimately, despite the perfection of his music, the difficulties of performance posed by Marin Marais’ pieces perhaps signalled the decline of the viol.